Dr. Edward Weston was an inventor, businessman and entrepreneurial genius who helped put Newark in the center of the nation's industrial map. After emigrating from England in 1870, he became one of America's leading nickel platers by the time he was 21. Weston was greatly influenced by Thomas A. Edison, also a Newarker at that time, and highly respected by all who came in contact with him. By 1877 he had purchased a former synagogue on the southern end of Washington Street, where he established the nation's first electrical machinery plant—the Weston Electrical Dynamo Motor Co. In 1881 Weston was enlisted by the Common Council to install five arc lights on posts in Military Park. He had the support of Mayor Fiedler, 'as long as the expense was not to exceed $300.' This was really extraordinary considering most Newarkers of the day did not think that electricity would really work, nor should the expense be borne by the local taxpayers. But Weston went ahead with the 'experiment' with the understanding that the local fire watch would be advised when the new lights were to be turned on. Despite a million bugs drawn to the site, the experiment was a phenomenon previously unexperienced anywhere. The country's first municipal underwriting of electrical street lighting was another first for Newark. Weston subsequently was responsible for lighting the Brooklyn Bridge, Boston's Forest Garden, an amusement park at Fort Lee and the Rockaway Beach Hotel at Coney Island. By the 1880s some thought that Weston's invention and its practical applications had rivaled Thomas Edison's. Within a few years he had become famous for his work with generators, underground cables, batteries and fuses. In 1870 the original Weston factory on Washington Street was destroyed by a fire. Weston moved to larger headquarters at Lackawanna, Plane, High and Orange streets. At this time the company's name was changed to the Weston Electric Lamp Co., reflecting Weston's increased interest in incandescent lamps. In 1883 the Weston Co. was taken over by investors interested in the profitable lamp-lighting business. The name was again changed, this time to the United States Electric Co. Although his name was no longer attached to the business, he was still in charge of the factory's operation. In 1886, Weston changed his chief interest to the development of electrical measurement devices. He had discovered the lack of stability in the measurement of electricity, and a need to do it efficiently. He also perfected a permanent magnet, and developed two new alloys: Constantin and Manganin, both essential in electrical measurement. Weston also perfected 'a new copper base alloy to use in delicate springs of electrical meters. But his greatest invention was that of the 'Normal Cell, ' considered the first stable standard for the volt, the basic unit of electromotive force. By 1888 he helped set up the Weston Electrical Instrument Co. in the laboratory of his High Street home where he produced the voltmeter. Also in the late 1880s, the electrical wizard helped to organize the Newark Domestic Telephone and Telegraph Co. By 1901 his company moved to the Frelinghuysen and Haynes site, where it employed 453 workers by 1902. Here the company remained in Weston's hands until 1924. During his life, Weston applied for more than 300 patents and became acknowledged as the world's leading maker of electrical testing devices. By the end of 1990, it was decided to sell the 9,600-foot factory and plans were made to relocate some employees to Pennsylvania. For nearly a century, the pioneering Weston and his colleagues made Newark a leader in outdoor lighting and the center for the manufacture of precise electrical measuring devices. The Murphy Varnish Works of Franklin Murphy grew to be the largest of the city's varnish factories, beginning in the 1830s with Samuel P. Smith's small varnish cooker in south Broad Street. Advertisements for the product were carried in Newark city directories as early as the 1840s. Soon Newark came to boast of five manufacturers, four of which were on Mulberry Street. The man who put quality into Murphy Varnish Co. was born in Jersey City on Jan. 3, 1846. At 16 he ran away to fight in the Civil War, serving in the 13th New Jersey Regiment of Volunteers. By the conflict's end, he had become a lieutenant. In the meantime, Murphy's parents moved to Newark where his father was a shoemaker. Upon his military discharge the young Murphy went into business with Thompson Price. Together they organized the original Murphy Varnish Co. in 1865. With the introduction of quality ingredients and steady management of the company, business soon flourished. Between 1860 and 1890 the varnish business continued to grow and profits rose from $800,000 to $1.9 million. Established in the late 1860s, Murphy became the major manufacturer of varnish in Newark and gained a national reputation. The leader, Murphy Varnish Works, was established following the Civil War in a partnership with Thomas Price. The company philosophy was to 'produce an inexpensive product and charge a dear price for it.' In 1891 the firm was incorporated and soon Murphy Varnish rose to the top of the industry. Like so many other Newarkers of the past, Murphy took a part in community life, serving on various boards of agencies and becoming involved in both local and state politics. He was ultimately elected governor of New Jersey. With the arrival of Murphy, product quality gradually improved to the point that it became one of the finest varnishes sold in the nation. For almost 80 years the name Murphy was tops in the varnish world. The produce was in great demand for carriages or railway car exteriors. To produce a better product, Murphy brought a first to the industry: a chemist to develop a better product. And the results paid off. Newark's old Board of Trade was especially proud of Murphy's success and the publicity the company brought to the city through it ads. According to the board, 'No other manufacturing industry in Newark has done more than Murphy's Varnish Company to make the city widely known. Its ads have appeared systematically in journals of international prominence, circulating in every village in the United States. Its staff visit at regular intervals, every town in the country of 1,000 population or more and many towns numbering even less. The important cities of Europe are even cared for and several of its important brands can be found on dealers and consumers' shelves abroad with the company's label printed in the language of the country, heralding the name of Newark.' The factory complex in the Ironbound section at Chestnut and McWhorter streets was built in four phases between the 1870s and the turn of the century. Today, parts of it still survive. But behind the complex are shiny rows of new townhouses. Before long, more of them probably will overwhelm the remaining structures. 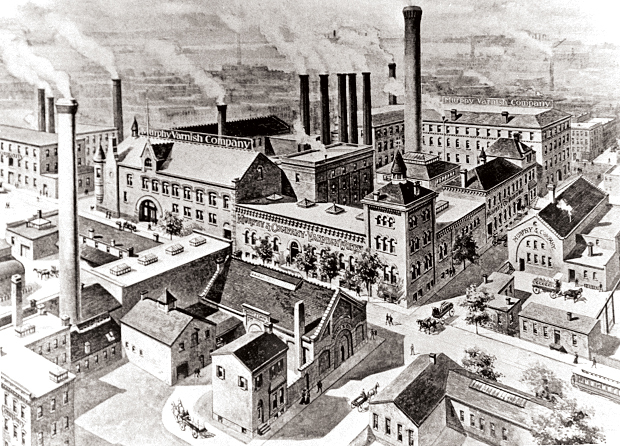 Terry Karschner's excellent study of 'Industrial Newark,' published in 1985, describes the complex: 'The buildings of the Murphy Varnish Company were built during a 30-year period and embodied the architectural styles of the times—a two-story 1870s factory in the Italianate style, followed by Newark architect James Lindsey's building in the 1880s inspired by the Richardsonian Romanesque, then a 1890s Victorian Renaissance firehouse and architect Howard Chapman's 1905 reinforced concrete factory.' What remains is impressive. If you have any interest in great factory architecture go take a look at what's left. While you're out, why not stop by the former Tiffany Company on Tiffany Boulevard in North Newark, whose operations were detailed last week. The factory has since been converted to condominiums. When asked his formula for success, Murphy said: 'I decided at the beginning of the business to make varnish for those who required the best. I had a conviction that the use of the best varnishes would cost the user the least money in the long run, or even in the short run. In order to satisfy the demands of my chosen customer, I knew that three things would be essential: I must provide ingredients of the best quality, and I must provide a plant which would be as nearly perfect as possible. And, most important of all, I must secure a working force, every member of which, in office and laboratory and sales department and process work, should be an enthusiast for the Murphy Varnish Company.' To many, Murphy represented the best in the city's manufacturing tradition.